It’s a rare opportunity for a self-funded booze blog to be able to taste test three fantastic, and not at all inexpensive bourbons side by side by side. I have just had such an opportunity. That’s right: Barterhouse, Rhetoric, and Lost Prophet… all on my dining room table! Now. I did enlist Susy, Dan, and my wife Kari for this taste testing. I took notes, Susy & Dan & I chatted, Kari made sure we had no idea which bourbon we were tasting. By the tasting notes, it’s difficult to tell which I liked best. And I’ll be honest here, this was a bit like choosing your favorite child. The deciding factor was really the finish, so I proclaimed that #3 was my favorite. 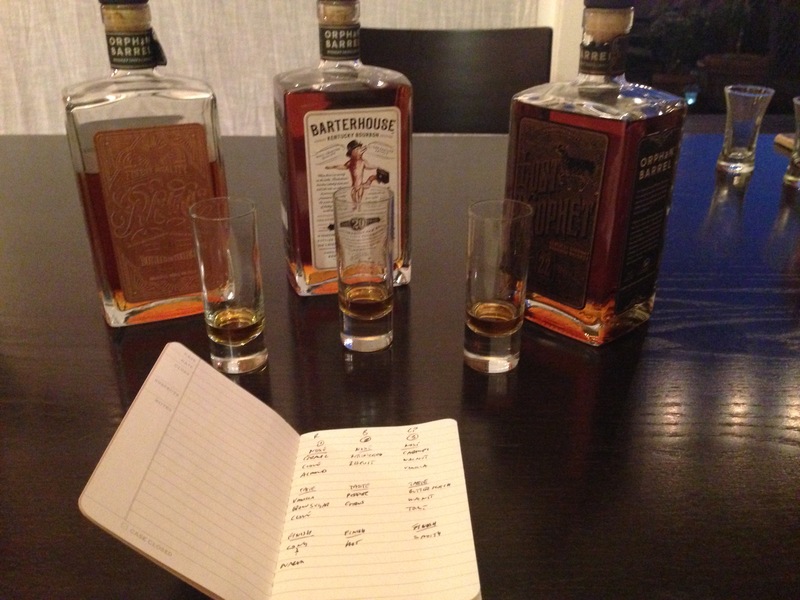 Bourbon #1 was Rhetoric; Bourbon #2 was Barterhouse; Bourbon #3 was Lost Prophet. We had done something similar not too long ago with other bourbons. I, also, distinctly remembered that no matter how poetic I get about Barterhouse, its barrel notes are dialed back. That made it easy to suss out which was Barterhouse. And with such pronounced barrel notes velvety smoothness on #3, that *had* to be the oldest of the troupe: the 22 year old Lost Prophet. Orphan Barrel’s offerings have gained a cult following… a cult that knows when a good thing has arrived and isn’t afraid to pay a premium for it.